What is Armour Thyroid? What is Armour Thyroid used for? Armour Thyroid is a Brand name for a hormone tablets derived from porcine thyroid glands that are used to treat an underactive thyroid gland. This medicine is also used in a prevention of certain types of enlarged thyroid glands and to treat thyroid cancer. Replacement or supplemental therapy in patients with hypothyroidism, except transient hypothyroidism during the recovery phase of subacute thyroiditis. Use as a pituitary TSH suppressants, in the prevention or treatment of different types of euthyroid goiters, including thyroid nodules, multinodular goiter, subacute or chronic Iymphocytic thyroiditis (Hashimoto’s) and management of thyroid cancer. Armour Thyroid is available in tablet form in following doses: 15 mg, 30 mg, 60 mg, 90 mg, 120 mg, 180 mg, 240 mg and 300 mg.
What is Synthroid? What is Synthroid used for? Synthroid is available in tablet for in following doses: 25 mcg, 50 mcg, 75 mcg, 88 mcg, 100 mcg, 112 mcg, 125 mcg, 137 mcg, 150 mcg, 175 mcg, 200 mcg and 300 mcg. Levothyroxine has been available in the United States since the 1950s, but the FDA didn’t approve it until 2000. Many patients suffer from hypothyroidism or underactive thyroid. Armour Thyroid and Synthroid are most popularly prescribed medicines to treat this disorder. One of many differences between these two medicines is for sure their way of produce. Armour Thyroid is considered as a “natural” preparation in which is thyroid hormone extracted from pigs, while Synthroid is considered as a synthetic substance. Since Armour Thyroid is “natural” it is more likely biologically compatible with humans compared to a synthetic Synthroid. However, studies and results find that Synthroid is considered safe and effective in humans. But, it is very hard to tell which one is better because certain patients may respond better to Armour Thyroid, while others may have significantly more therapeutic benefit from Synthroid. Armour Thyroid and Synthroid have many similarities. Both are used as a replacement therapy and work by imitating neurophysiological effects of endogenously T4 (thyroxine) and T3 (triiodothyronine). They modulate DNA transcription, protein synthesis and basal metabolic rate, tissue oxygenation and lipolysis. Both products are approved for same indications and have similar side effects profiles. Their half-lives are also the same and are 6-7 days after administration. 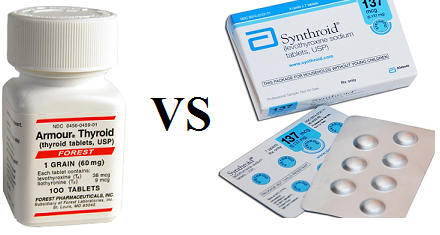 Synthroid is older medicine than Armour Thyroid and has undergone widespread clinical testing for hypothyroidism treatment and it has been considered clinically effective by the FDA since 2002. Randomized controlled trials have been showed that Synthroid is far effective than placebo. Unlike Synthroid, Armour Thyroid formulations have not been formally yet evaluated by the FDA. Since, there is a lack of clinical studies, Armour Thyroid efficacy as a treatment for hypothyroidism is still questionable. However, there are some studies with evidence that Armour Thyroid is equally as effective as Synthroid for the treatment of hypothyroidism. Most health professionals will tell that each medicine is capable of improving TSH, T4, and T3 levels. The American Association of Clinical Endocrinologists and the Royal College of Physicians suspect that side effects are more likely to be caused during Armour Thyroid thrapy than Synthroid. There are severe reasons why Armour Thyroid may provoke side effects such as: ratio of T4 to T3 (significantly different from endogenous ratios in humans), inter-batch variability and the lack of clinical trials for FDA approval. Also studies have been found that Armour Thyroid will more likely cause moderate weight loss of approximately 3 lbs, while Synthroid doesn’t cause weight lose.